The New Small Aircraft (NSA) is the project name for the 737 MAX replacement. All we know about it is what CEO Jim McNerney said on 4 Nov 2014 "It will be slightly larger than the 737, but its shape won't change dramatically from the current fuselage. By 2030 we will have a new airplane. There is a good chance it will be a composite airplane." On Nov 5 2014, CEO Jim McNerney said that Boeing is in the early stages of sketching out an all-new aircraft with new engines and possibly a composite structure to replace the single-aisle 737 MAX. The proposed new aircraft McNerney talked about will be slightly larger than the 737, but its shape won't change dramatically from the current fuselage. "By 2030 we will have a new airplane," he said, adding there's "a good chance it will be a composite airplane. McNerney said competition from China and elsewhere is driving talk for a new jet. McNerney said an all-new 737 MAX replacement was needed because competitors' products would resemble the MAX, and Boeing needs to innovate to stay a step ahead. "Keeping up purely on price will be difficult,"
12 Dec 2014 - Boeing Commercial Airplanes VP marketing Randy Tinseth, on his 'Randy's Journal' blog, stated (11-Dec-2014) there has "been a lot of talk lately about a replacement for the 757", while noting that the 737 Family, including MAX, is capable of serving 95% of routes that 757 can cover. He said: "The fact is, today’s 737 and other airplanes its size already fly 90 percent of flights that used to be operated with a 757. And in the future, that number will jump to 95 percent thanks to airplanes like the 737 MAX." He continued: "For example, take Norwegian Airlines. They recently announced plans to use the 737 MAX 8 on transatlantic routes beginning in 2017. Other large 757 operators have publicly noted their continued discussions with Boeing around airplanes for transatlantic missions". On Airbus, Mr Tinseth said: "Meanwhile, Airbus claims its proposed long ranger version of the A321neo is a true 757 replacement. In reality, it falls short in two big ways. It can’t match the 757’s range, and it can’t carry as many passengers", adding: "The 737 MAX 9 and the A321neoLR are both capable of North Atlantic range by adding auxiliary tanks, with the 737 MAX 9 flying the mission more efficiently. The A321neoLR needs three auxiliary tanks and increased takeoff weight— while the 737 MAX 9 could do the mission with just one auxiliary tank, allowing for more cargo space." On the 737 MAX 8 and MAX 9, Mr Tinseth said: "The 737 MAX is a great airplane that’s sized right for the heart of the single-aisle market— along with the right range capabilities. It’s a key part of our overall product development strategy, that along with the 777X and 787-10, is set for the next decade. As for that space in between the upper end of the 737 and the 787-8, we continue to talk with our customers to better understand their needs in the future." For years, Boeing wrestled with how to replace a best--selling single-aisle product with an all-new design in one size s-ector while simultaneously protecting the longer-range, middle-of-the-market (MOM) from the predatory ambitions of Airbus. Although this may sound like the 737 and 757 replacement conundrum faced by Boeing today, it is, in fact, the scenario that challenged the company almost 40 years ago. In the 1970s Boeing was grappling with how to replace the 727 and at the same time counter the emerging threat of the Airbus A310, the first derivative of the A300 family. In a curious parallel to the situation today, Boeing’s market analysis for filling the 180-300-seat gap in the 1970s indicated that although the two requirements overlapped, it was too difficult to meet them both with a single-fuselage cross-section aircraft. A single aisle worked better for the lower end, but did not stretch very well. A twin aisle worked better for the upper end, but equally did not shrink well. As a result, for almost six years in the 1970s, the company exhaustively studied two concepts: a single-aisle twin dubbed the 7N7 and a widebody twin called the 7X7. Most observers at the time believed Boeing would develop one or the other but not both, at least not immediately. It was therefore with some surprise that between 1978-79, over a period of less than eight months, the company ambitiously began the simultaneous development of both aircraft. The 7X7 became the 767 in July 1978, while the 757, formerly the 7N7, received the production go-ahead the following March. But will Boeing repeat history to answer the long-running 737/757 replacement question, and if so, why? The answers lie in the way the 757 and 767 were developed and, more important, in what they share in common. Although designed to serve very different markets, Boeing ended up developing the 757 and 767 as sister aircraft that shared key design features, including common cockpits, and used many common parts and systems. The novel approach reduced development cost and made the aircraft more attractive to operators of both types. Faced with converging requirements, Boeing is considering using the same blueprint as it reviews its options for developing the new small airplane (NSA), and a parallel new “middle-of-the-market” aircraft that would go beyond simply filling the 757 replacement niche. “We talk about reuse of architectures and equipment, and the 757/767 are great examples,” says Mike Sinnett, vice president of product development for Boeing Commercial Airplanes. Although developed for different roles “the systems were 40% common, they had common cockpits and a common type rating.” Because it worked before, the design approach is something “we would have in our mind going forward,” he adds. The first indications of Boeing’s renewed interest in NSA came from CEO Jim McNerney who, speaking last Nov. 5 at an innovation conference in Abu Dhabi, said: “By 2030, we will have a new airplane.” The aircraft “will be slightly bigger,” and have new engines. McNerney added that there is “a good chance it will be a composite airplane.” Sinnett acknowledges that the 2030 timing is as much driven by crystalizing of airline demand as by readiness of technology. “The technology suite that exists today incorporated in an all-new airplane would not be any better than a MAX today. 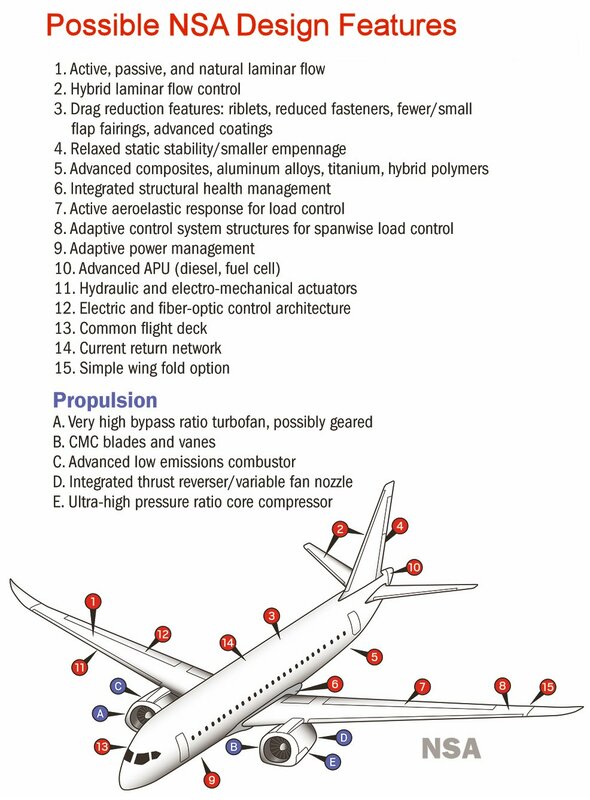 The 737 has been optimized [very] well over the decades and MAX continues that with another step change. It has become really hard to beat.” Although Boeing pushed the state-of-the-art in commercial structures, systems, design and propulsion with the 787, Sinnett projects that “it will be the end of the next decade before we have the technology available,” to the point where it would warrant service entry of an all-new family. Rejecting reports elsewhere that an NSA could be launched later this decade for possible service entry as early as 2025, he adds that “for the middle of the decade we couldn’t do better than the MAX; it is probably another five years beyond that.” However, engine makers confirm that Boeing has asked them to restart the NSA powerplant studies they undertook up to 2011, as well as to evaluate concepts for a 757 successor. GE Aviation President David Joyce says “we all had an NSA engine.” But he points out that the technology advances since that time mean that the architecture must be totally reevaluated. “In terms of replacements of 757s, you can imagine we’re all having that dialogue right now.” While Joyce also casts doubts on any go-ahead in the medium term, he adds: “If it does [proceed], I think it is right in the sweet spot of the technologies that are developed between the [CFM] Leap and the GE9X [for the 777X], depending on what the time line is. We have another whole block of technologies we are looking at in addition to that. There are some pretty radical architectures out there. As you know, we have a history of looking at some wild stuff, like the unducted fan, and a few other things like the three streams in the military world. So the architecture guys are busy.” Eager to reenter the single-aisle market that it effectively exited with the sale of its share in International Aero Engines, Rolls-Royce has also laid out plans for Advance and UltraFan future engine architectures designed to meet a wide variety of power demands for new aircraft from 2020 and 2025, respectively. Pratt & Whitney has meanwhile vowed to develop year-on-year fuel-burn performance improvements to the geared turbofan, which enters revenue service on the A320neo and CSeries in 2015, and sees itself as a strong contender to be among the engines offered on future Boeing NSA/ MOM concepts. With longer-range, higher-capacity versions of the 737-900ER, MAX and A321neo nibbling away at the edges of the classic 757 market, the key unknown remains whether an all-new replacement would not only recapture this lost ground but also expand a new niche beyond that of the current 757. To Richard Aboulafia, vice president of analysis at the Teal Group, the answer is “a no-brainer.” He believes there is a market for 3,000-4,000 757-size aircraft over 20 years. Aboulafia envisions an aircraft seating approximately 220 passengers and flying up to 5,000 nm. The passenger capacity would therefore be similar to the high-density layouts of the 737 MAX or A321, but would be achieved in a configuration suitable for legacy carrier long-haul services. Aboulafia believes the aircraft should offer a 20% unit cost advantage over the existing 757. Another factor influencing the decision about a possible new 757 type aircraft does not have to do with the segment itself, but rather with how competition between the MAX and the neo plays out. Airbus, which launched the neo eight months ahead of the MAX, holds 57% of the firm orders so far. Aboulafia argues that if the market shift of Airbus controlling 60% is “structural” (i.e. permanent) then Boeing may be forced to counter with a new concept that will be bigger than the MAX to address the gap left by the 757 and, more important, solidify its position in the narrowbody segment.